IBM -- AT&T (NYSE: T) and Altria (NYSE: MO). 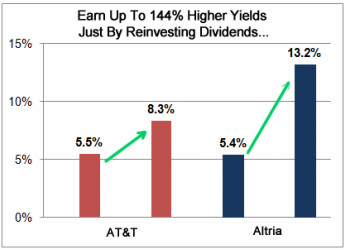 If you put $5,000 into AT&T five years ago, you'd have earned a 5.5% yield at the time. That's $275 per year. But today, that $5,000 investment would be paying $417 a year if you simply reinvested your dividends. That's an 8.3% yield on your original investment. Altria is an even better story. Right now, the shares pay a solid 5.4%. It's nothing to sneeze at, but thanks to the company's commitment to dividend growth, $5,000 invested just five years ago -- plus reinvested dividends -- is now earning 13.2%, or about $660 every year. That makes for a 144% higher yield in just 5 years. It's doubtful most of us will have decades and decades to invest like our grandparents and parents but that doesn't mean we can't see our dividends grow enormously in a span of just a few short years by simply choosing our dividend payers wisely and then reinvesting the payouts. a select group of dividend payers out there that yield up to 11.3%, yet the mainstream financial media is reporting that they yield as low as 1.5%. I've already alerted readers of my newsletter, The Millionaire Advisory, to this "glitch," -- and I don't think the secret will last for long. I urge you to check out our brand-new report on these "Hidden High-Yielders" before everyone else finds out about them.